Toyota has equipped the Tacoma with a spring-over, solid-axle rear suspension that utilizes leaf springs with shock absorbers. This arrangement provides for a good deal of travel and articulation, and can easily be improved upon with bolt-on aftermarket modifications. I wanted to increase the ride height in the rear as well as compensate for the heavy load that has been added to the stock vehicle weight. In doing so, I have tried some various things over the years before arriving at the current configuration. I think I may have finally achieved the "ultimate" rear suspension for my Tacoma, considering my applications (an expedition vehicle with more technical terrain in mind). 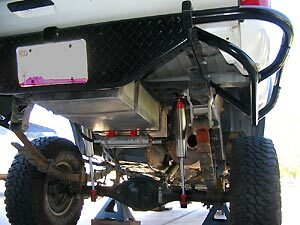 This truck is used for sleeping quarters as well as carrying gear and supplies for long-term trips, so I need to use shocks that will fit under the truck without going through the bed. The shocks I have tried in the past (KYB, Bilstein 5100 series, Rancho RSX9000) are great for a while, but just don't last or won't sufficiently dampen the load. I decided to forego the stock mounting locations in favor of custom mounts, so that I could utilize a pair of RaceRunner 2.5" Reservoir shocks with a 10" stroke. I only wish I had done this sooner! Sway-A-Way custom-valved these shocks based on my specifications and they work VERY well. The shocks are not so stiff that they ride like a brick, but they control the weight much better than previous shocks did. I specifically wanted a shock that would employ more rebound control and these do the trick. They can be fully rebuilt and revalved as well. Another issue I have been repeatedly faced with is the longevity of shocks used in the stock mounting locations. The stock mounting locations require the use of standard diameter shocks, which just don't have enough cooling capacity for a truck like mine. With the reservoir shocks that I am currently using, the entire shock body and part of the reservoir is filled with oil. Along with the larger diameter, this makes for a HUGE increase in cooling capacity over the "regular" shocks I had been using. Even after extended high-speed runs on dirt tracks these shocks only get mildly warm to the touch. 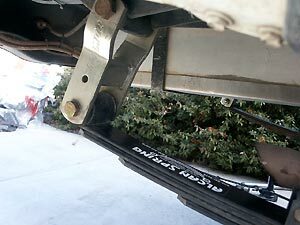 The other part of the equation are quality leaf springs and extended shackles (rear spring hangers). I chose custom full-replacement leaf packs from Alcan Spring, and Heavy Duty shackles from Downey Off-Road. Click on the photo to view the installation article. What shock length do I need?